So happy to have her sister back by her side, Anna is ready to wear her crown and step into her role as Princess. 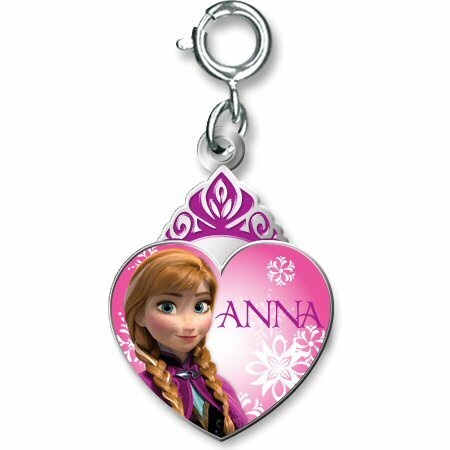 Celebrate the awesome power of love with this beautiful Frozen Anna Crown Heart charm by CHARM IT! With Anna's name in elegant magenta lettering on a snowy background of pink hues, this fun Frozen charm features a smiling Anna in her signature caped dress and long red braided hair. This amazing full-color Anna charm, with its hot pink enamel crown atop the shiny silver heart, will be a treasured charm bracelet keepsake for years to come, because you just never outgrow Disney! This beautiful Frozen Anna Heart charm features a glittery silver heart showing through the die-cut purple heart. Celebrate a heart of optimism and friendship with this beautiful Frozen Olaf Heart Locket charm by CHARM IT! This lovely Frozen Elsa Crown Heart charm features a smiling Elsa in her signature blue dress and long blonde braided hair. This beautiful Frozen Elsa Heart charm features a glittery silver heart showing through the die-cut blue heart. While made to hold a dazzling array of fun charms, this colorful Rainbow Chain Charm Necklace even looks good all by itself!